Beating Windward Press LLC, 9781940761152, 118pp. Leo joined AmeriCorps to do something important with his life. When his team is sent to rebuild St. Bernard Parish after Hurricane Katrina, he believes he'll finally make a difference in the world. But while other teams do the "real" work of gutting and rebuilding houses, Leo is assigned to the camp newsletter. His friends Snave, Cirelle, and Davy have Equally unglamorous minor jobs in the kitchen and supply rooms. Only Kiley, the girl Leo pines after, spends her days saving "da parish" from ruin. Frustrated, Leo and his friends chafe against authority and each other in a town longing for renewal. They're all looking for something. Or running from something. Often, both. 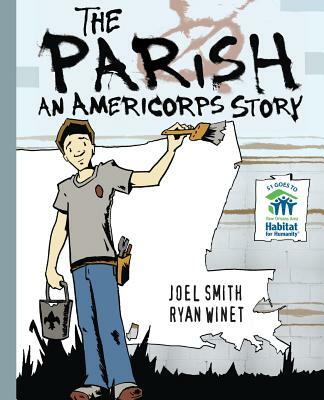 Inspired by the author's own experience in the aftermath of Katrina, The Parish is a graphic novel about growing up and the tug-of-war between selfishness and service. In keeping with that spirit, Beating Windward Press donates $1 from each copy sold to the New Orleans Area Habitat for Humanity.